UDM Downloads > my Ten Key 4.0 - The Ultimate Accountant's Calculator! A familiar ten key calculator for the office professional designed by a CPA. 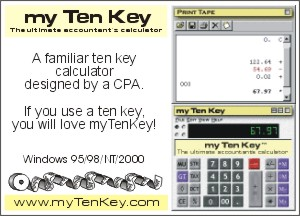 If you use a ten key desktop calculator, you will love myTenKey! Includes a sizable and realistic adding machine tape that can be printed, saved, or copied to your favorite program. A tape can also be edited and processed again without changing the original tape. Not only does myTenKey operate and sound like a real ten key, it includes a conversion calculator, a fraction calculator, realistic controls, and a minimize to the tray option. Grand total, item counter, mark up, tax, discount -- it's all here. Download your copy today.